Are Carrots Good For Dogs? Any health benefits or risks? Vet approved! Yes, carrots are a healthy treat for dogs. 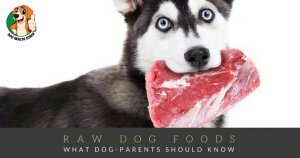 They are a great low-calorie, low-fat snack for your canine buddy as long as they’re given in moderation and your dog does not suffer from a health problem like diabetes. Carrots are low in calories but packed with fiber and vitamins. This popular vegetable is not only good for the eyes but also help boost the immune system and for general wellbeing. Crunching on carrots can also be good for your dog’s teeth. Munching on carrots gives your dog’s teeth a good mechanical scraping while preventing the buildup of plaque and tartar. Dogs suffering from digestive upset may benefit from eating some carrots. The veggie is high in soluble fiber which can add bulk to your dog’s stools. But if it’s your dog’s first time to eat carrots, start slow. The high fiber content may lead to digestive upsets and gassiness. Also, make sure that your pooch has plenty of water to assist the passage of fiber through the gastrointestinal tract. 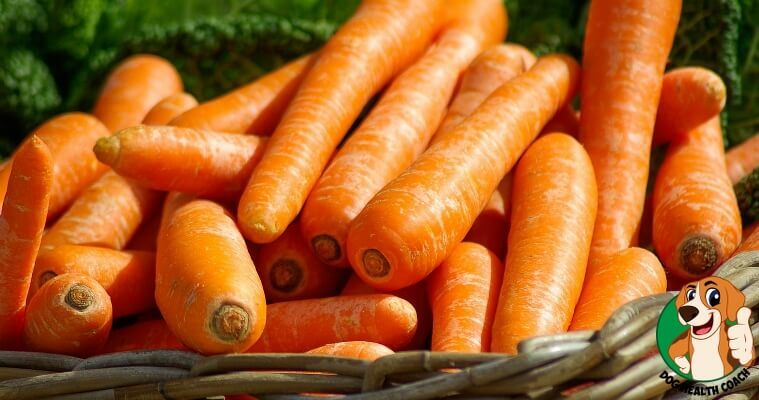 Beta-carotene is a type of carotenoid that is a precursor to vitamin A. It is a popular antioxidant which can help counteract the effects of free radicals in the body. Vitamin A is important for eye health, as well as for skin and coat health. It also promotes immune system function. It is a fat-soluble vitamin which when given in excess can accumulate in the body and become toxic. This is another important reason why carrots should be given in moderation. What’s the best way to serve carrots to dogs? The best way to serve carrots to dogs is to lightly cook and shred this root vegetable before offering. You can also give carrot juice to your dog; as always fresh is best. There are organic juices available on Amazon, but as those are quite expensive, a quality blender might be the smarter choice if you plan to prepare those on a more regular basis for your pooch or yourself. Carrots can also be given raw to dogs but make sure that they are sliced into bite-sized pieces to prevent choking. And always remember moderation is the key to avoiding potential problems. Plain carrots only for dogs! While carrots are considered to be a very healthy treat for dogs, they should still be given in moderation. Avoid adding sugar, salt, or spices because these can be harmful to your pet. Cutting them up bite-sized can promote digestion and prevent choking. Remember, a dog’s digestive system is not as efficient in digesting carrots, so you are likely to see undigested carrots in their stool. Are carrots good for puppies? Yes, puppies can eat carrots in moderation. Frozen carrots are perfect for puppies that are teething. Munching on frozen carrots can help relieve pain and discomfort associated with the growth of new teeth. What about cooked carrots and dogs? Yes, your pooch will love cooked carrots. 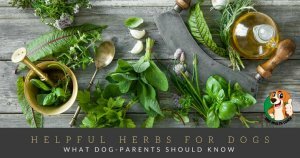 They are safe for dogs as long as you don’t add salt, sugar, or spices when cooking. Giving carrots to dogs with diabetes is NOT recommended because of the natural sugars that the veggie contains. One likely problem with carrots is that the nutrients they possess are deeply embedded in the cellulose. A dog’s digestive system is not fully equipped to digest cellulose so they may not fully benefit from the essential nutrients that are present in carrots. But cooking and shredding can help ensure that most of the nutrients are available to your pet. In conclusion, carrots are healthy treats for dogs, especially when given in moderation. There is still no substitute for premium quality pet food in meeting your pet’s dietary needs. Did we miss anything? Your comments are most welcome.